Green Tea Extract - What is it? The EGCG in green tea extract protects against digestive and respiratory infections, blocks the actions of carcinogens which promotes cancer, is anti-bacterial, and also helps lower cholesterol levels. Green tea extract is also a common ingredient in many fat burners - it helps with thermogenesis and helps the metabolism of fat. It works without increasing the heart rate which is most often associated with most fat burners. With green tea, dieters get the weight loss without the jitters and side effects. Green tea extract itself is used as a weight loss supplement among its many other beneficial uses. Green tea extract also helps reduce the risk of heart disease, cancer, and has been recently show to help prevent liver failure. 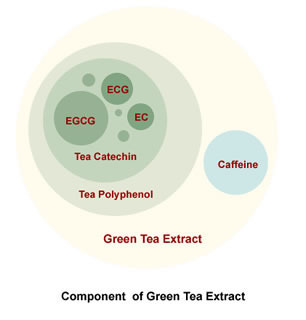 .Green Tea Study 2: In a research studying the effects of green tea on treating acne, researcher Gan Wong et al. (Memorial Medical Center in the Philippines) compared the effects of 3% green tea cream and 4% benzoyl peroxide on moderate to severe acne. 108 subjects were randomized into 2 treatment groups: 1) benzoyl peroxide cream and 2) green tea extract cream, and the creams were applied twice daily for 12 weeks for the 2 groups. The study found the green tea cream to lighten patient's skin color and improve overall skin complexion. The study also suggests that green tea extract cream causes fewer side effects than benzoyl peroxide, and the green tea group reported fewer cases of dry skin, itching, and allergic responses. Green tea leaf extract contains EGCG, a powerful antioxidant 200 times more potent than vitamin E.
Green tea leaf is anti bacterial, helps lower cholesterol, reduces inflammation, and lowers blood pressure. It also help prevent some forms of cancer including colon, pancreatic, and stomach cancer. Green tea extract stimulates the immune system, and also helps defend against dental plaque. Green tea extract also protects against liver damage. Some new research suggests green tea may help prevent liver transplant failure in patients.